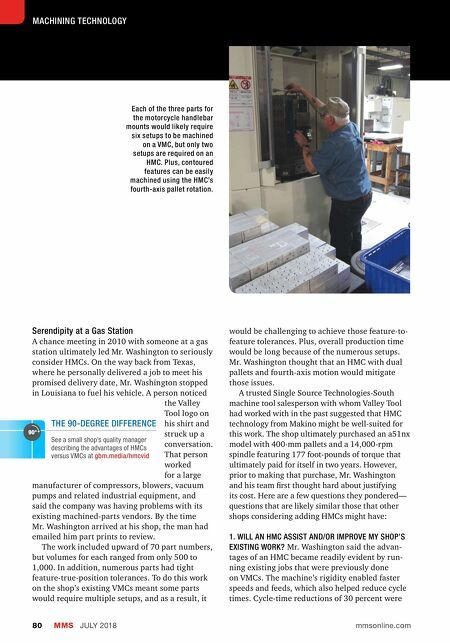 Horizontal Machining Centers Modern Machine Shop 81 common the first time a job ran on the HMC compared to when it ran on a VMC, he says. The second time, improvements in programming, tooling and other areas often led to cycle-time reductions of 65 percent. For example, Valley Tool was awarded an assortment of parts that needed to be delivered in short order. To expedite delivery, the shop ran some of the more basic parts across a VMC while it completed more intricate parts on an HMC. However, on a few occasions, it eventually trans- ferred some of the more basic parts to the HMC to improve cycle time and quality (regarding true position from certain datum points) thanks to a reduced number of setups. After two weeks of VMC programming and fixture design and manufacture for one of those jobs, plus an additional two weeks of fighting to make good parts, the shop threw in the towel and started from scratch, running the job solely on the HMC. In less than 10 days, it was running good parts on the HMC, thanks in large part to reducing setups from six to two. In addition, cycle times were reduced from 45 to 18 minutes. 2. HOW MUCH ADDITIONAL COST WILL THERE BE TO GET THE MOST OUT OF AN HMC? HMCs cost more than VMCs, and additional investments are required to use them to their potential. For example, Valley Tool poured 24-inch-deep slabs for each HMC independent of the shop f loor to minimize the risk of vibration. 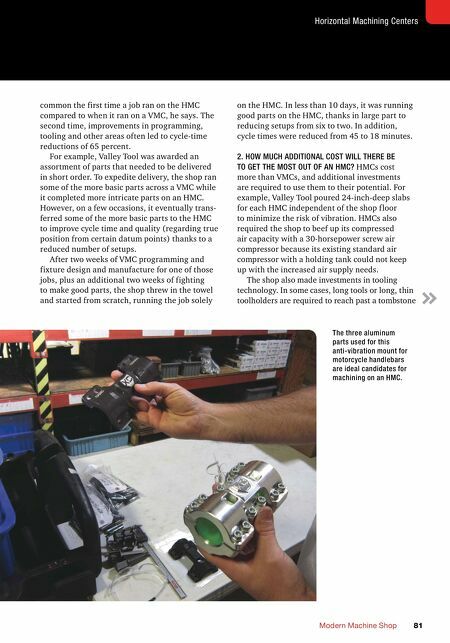 HMCs also required the shop to beef up its compressed air capacity with a 30-horsepower screw air compressor because its existing standard air compressor with a holding tank could not keep up with the increased air supply needs. The shop also made investments in tooling technology. In some cases, long tools or long, thin toolholders are required to reach past a tombstone The three aluminum parts used for this anti-vibration mount for motorcycle handlebars are ideal candidates for machining on an HMC.